On February 28th, the JATC hosted several members of the Washington, DC commercial construction industry for a tour of the JATC that included its latest energy efficient upgrades. JATC Assistant Director Ralph Neidert conducted the tour. Neidert, a master electrician in Maryland, Virginia and West Virginia, was also the first to become certified and conduct training for Electric Vehicle Supply Equipment in the DC area. In addition to powering the building, these and other energy generating equipment are used as hands-on training tools for the JATC’s apprentices. The tour showcased the cooperative spirit between the Electrical Alliance’s members—Washington, DC Chapter of National Electrical Contractors Association and International Brotherhood of Electrical Workers, Local 26—in developing and promoting the value our craftspeople bring to the markets we serve. 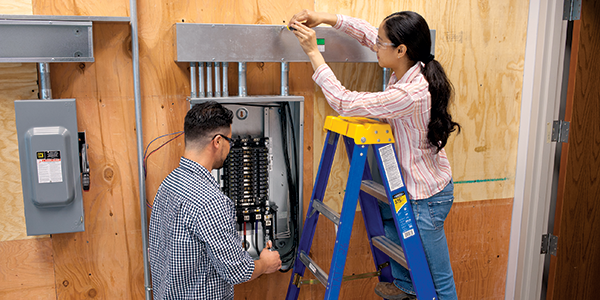 “Each year these groups make a cooperative investment of more than $ 7 million in training, so the electricians in the field can handle projects requiring the highest skill level,” said the Electrical Alliance Vice President of Industry Development Michael Mock. To find an Electrical Alliance contractor for your next project, search the database at www.electricalalliance.org.